As one of Disney’s Signature dining spots, Flying Fish Cafe has high expectations to meet. Located at Disney’s Boardwalk Resort, Flying Fish offers a whimsical and fun, yet upscale dining experience a mere ten minute walk from Epcot. Walking down the wide midways of Disney’s Boardwalk, it’s not easy to miss the neon jumping fish flying high in the sky. Amid the family friendly pace of the Boardwalk Inn is one of Disney’s best-kept dining secrets. When I first heard of the Flying Fish Cafe, I expected fried fish in a casual atmosphere. What I was treated to was one of the best meals I’ve had at a Disney restaurant –– hands down. A panoramic of Flying Fish Cafe at Disney's Boardwalk. The lobby is small and intimate. There is a waiting area for a few parties, and beyond that is an expansive dining room complete with a full service bar and lots of whimsy. What struck me most about the interior of the restaurant was how time seemed to slow down. The roller coaster mural on the wall depicts New York’s Coney Island and there is a beautiful Ferris wheel towards the back of the restaurant. The lighting was a deep blue color, with hints of gold and white throughout. Most Disney restaurants are quite loud, and Flying Fish Cafe was no exception. It wasn’t loud enough to miss conversation at the dinner table, however. The tables were far enough apart that you could talk comfortably with your dining companions and not hear the tables next to you. Flying Fish had an incredible wine list. We tried a glass of the Flying Fish Merlot. It was very reasonable at $9 per glass. The wine was great to sip on through the meal and wasn’t too strong. It was the perfect balance. In addition to the merlot, I do recall seeing wine from the Lasseter Family Winery. Lasseter being John Lasseter, of Pixar fame. One of my minor annoyances with traveling is the lack of widely available sweet tea. You know, Southern style black tee with copious amounts of sugar and lemon. We ate at Flying Fish on our first night and I had not yet slipped into full-on vacation mode. It’s usually pretty jarring when I order sweet tea only to have the waitperson say they have “iced” tea, which is unsweetened and bitter. Much to my surprise, Debra, our waitress said that she could have the bar make a “killer” sweet tea. I obliged and was incredibly pleased! It was iced tea mixed with some sugar water from the bar, served with two slices of lemons. Debra was super accommodating in offering to make this southerner a glass of sweet tea. I may have asked for a few refills and it was worth it. We wanted to try an appetizer, which is the norm for me at a Signature restaurant. There are usually one or two things that I just can’t pass up. Our appetizer came fresh from the sea. It was fried calamari and Florida rock shrimp. Debra, again, made an accommodation and had the kitchen split the calamari and shrimp on separate sides of the plate. Normally, they’re served mixed together. Calamari is one of my least favorite textures. It’s like eating a greasy rubber shoelace. Thank you again, Debra. The shrimp were cooked perfectly, slightly salt-and-peppered with a light batter that had an excellent crisp to it. The sauce they were served with was savory as well. It was smoky and thick, the consistency of a barbecue sauce. It had a nutty flavor and it was described on the menu as “Asian-inspired.” You could taste the sesame and sweet. For $15, it was a solid choice. The pacing of our meal was spot-on. We took our time and enjoyed every course. After the appetizer, it was time for entrees. There was one entree I had my eye on for weeks before finally visiting Flying Fish Cafe. Fish can be hit-or-miss. One of my personal thoughts about ordering fish is that if the restaurant I’m dining in is not located directly by the ocean, there’s no way the fish can be fresh. My trust in Disney contradicts that rule, so I felt confident in my choice. The most popular dish at Flying Fish Cafe! Potato-wrapped Red Snapper. Sort of a surf and turf, the “Flying Fish Cafe Duo” pairs an Angus New York Strip steak with the signature dish at Flying Fish, the Potato-Wrapped Red Snapper. Strip steaks at non-Signature restaurants are usually terrible. As much as I love Whispering Canyon Cafe, the steak I had there a few years back spooked me from ordering that cut of beef for a really long time. 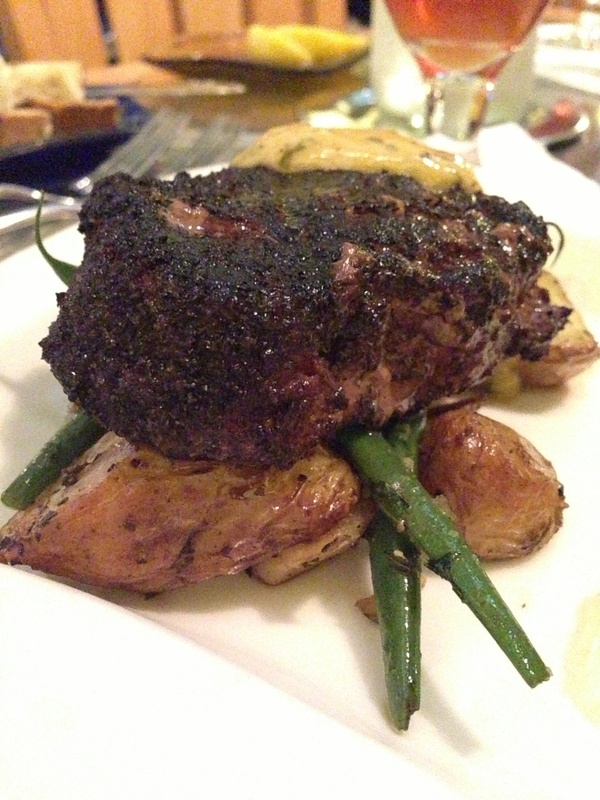 The steak was served with green beans, roasted potatoes and a creamy béarnaise-like sauce. I ordered it medium-well and the char was perfect. There was not a single piece of fat to be had. Impressive. The highlight of the duo, though, was the Potato-Wrapped Red Snapper. Snapper is a pretty mild fish. If you’re not used to ordering fish or would like to venture away from poultry, if only for a night, I would highly recommend Snapper to start. The potato wrap was light, flaky and slightly browned. The fish was incredible. It was served with a red wine reduction and a leek fondue. Honestly, I could have licked the plate. Instead, I just asked for more of their crusty sourdough break to sop up the scraps. When Debra took the plate away, it had been wiped clean! New York Strip Steak. Served with roasted potatoes and green beans. Even though the steak was served with potatoes, a particular a la carte side caught our eye. Roasted potatoes are great; au gratin potatoes are better. The potatoes were coated in a creamy mixture of Gruyere and Parmigiano-Reggiano cheese and broiled to achieve bubbly cheese nirvana. When my Mom makes au gratin potatoes, I fight for the corner scoop because you get to double up on the brown bits. You know, the pieces that have been under more direct heat so that they crisp up but still have enough give to melt in your mouth? Debra must have read my mind, because we had a perfect portion of au gratin potatoes with plenty of brown bits. The poor potatoes never stood a chance, being yet another plate subject to heavy scrubbing from a piece of sourdough bread. The cost of the entree duo was $47, just $4 more than ordering the NY Strip on its own. We laid out $8 for the au gratin potatoes. Being no stranger to the Walt Disney World Resort, I take pride in my ability to plan a vacation that can be both relaxing, yet packed with activities. One variable that can throw dining plans way off is relying on Disney transportation. Prior to our dinner at Flying Fish Cafe, we napped at our resort, Pop Century. There’s a few ways we could have arrived at the Boardwalk for dinner. Not everything went according to plan, and we ended up on a bus to Epcot, ran through World Showcase and then took a slow –– I mean tranquil –– boat to the Boardwalk. That made us about 30 minutes late for our reservation. Disney's Boardwalk is one of the most immersive resorts on property. It blends a resort with shopping, dining and a convenient way to get to Epcot. I attempted to call ahead, but couldn’t locate a direct phone number to Flying Fish Cafe and kept getting through to central reservations, where I heard a spiel about how my reservation was no longer guaranteed and the only way to know whether or not I could be seated would be to talk to the host when I arrived. I fully expected to wait for a table, recognizing and fully understanding that our tardiness was my fault. When we walked in, the hostess, Eva was beyond hospitable. The wait was less than five minutes; we were greeted with a smile and didn’t receive a lecture about their cancellation policy. Eva had our back! Debra, our waitress was fantastic and made sure our meal was pleasant. Our drinks were always fresh, the pacing of the entire meal was perfection and after we paid, Debra offered to show us around the restaurant and pointed out details, like the roller coaster mural I mentioned earlier. Both Eva and Debra have earned lifelong fans and I hope we see them again on a future visit! Much like the entree duo, I decided on the dessert trio prior to arriving at the restaurant. A few months back, I wrote about my experience ordering this dessert. In summary, our waitress said that we should choose two other desserts and she would bring us a trio “to try.” Those last two words suggested the quality of the dessert. The trio follows a trend of food that looks like other food. Flying Fish deserves points for theming the dessert to their restaurant decor, however the sum of the dessert’s parts was nothing spectacular. You're never too full for chocolate. This was far superior to the trio. We ended up ordering the “PB&J Crème Brûlée” and the “Nuts About Chocolate Indulgence.” The crème brûlée was made of raspberry confiture with a double chocolate biscotti and chocolate ganache on top. Chocolate is my weakness and I can always make room for an all-chocolate dessert. “Nuts About Chocolate” was caramel chocolate and hazelnut praline mousse, a candied pecan and butterscotch-laced Blondie, chocolate sorbet and candied almonds. Crème brûlée was $7; chocolate goodness overload was $8. Sometimes Signature restaurants can under deliver in the dessert area. Had we only ordered the Concession Sweet trio, we would have left disappointed. Thanks again to Debra for steering us in the right direction. A unique take on peanut butter and jelly! Disney’s Signature restaurants are host to some of my favorite dining spots in all of Walt Disney World. When my friends ask me why I vacation at Disney, I can’t help but believe they imagine an amusement park, where we eat overpriced hot dogs and ride cookie-cutter coasters built on a parking lot. Experiences like the one I had at Flying Fish Cafe provide me with enough ammunition to refute any claims about Disney being “for children.” In all of the traveling I’ve done and places I’ve eaten, I’ve never had service like what I’ve encountered at the Disney Signature restaurants. Flying Fish Cafe is a beautiful, bustling restaurant on Disney’s Boardwalk with excellent food, great staff and delicious desserts. If you’ve yet to try one of Disney’s Signature restaurants, I would be pleased to recommend Flying Fish Cafe as your first endeavor. Flying Fish Cafe. Disney’s Boardwalk. Reservations accepted; recommended based on the time of year. (407) 939-2359. As to be expected from a Signature Restaurant, Flying Fish Cafe is decked out.